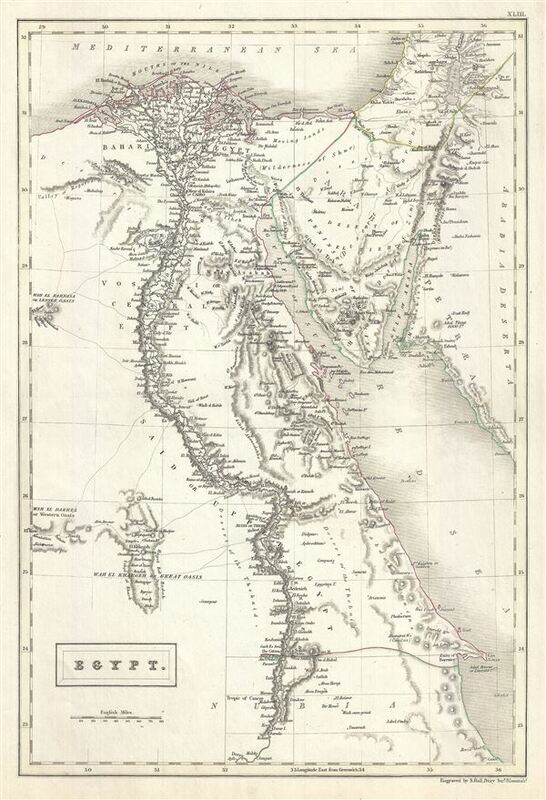 This is an attractive Adam and Charles Black's 1844 map of Egypt and the Sinai. It covers modern day Egypt as well as parts of adjacent, Palestine, Israel, Sudan, and Jordan. Various towns, cities, rivers, mountains, oases, and several other topographical details are noted with relief shown in hachure. This time in history marks the decline of the Ottoman Empire and its hegemony over this region. After the conquest of Palestine by Muhammad Ali's Egypt in 1832, British intervention returned control of Palestine to Ottoman rulers in 1840. In Egypt, following the expulsion of the Napoleonic forces by the Ottoman Mamluk Turks, Muhammad Ali, the Ottoman viceroy of Egypt, established the Mamluk Dynasty that would rule Egypt until the Egyptian Revolution of 1952. Between 1820 and 1833, Ali annexed northern Sudan, Syria and parts of Arabia into the Mamluk Empire. In 1848 Abbas I, his grandson, was ruler of Egypt and Sudan. Abbas I, who spent most of his time in seclusion on the insistence of the British government, was responsible for the construction of the historic railway from Alexandria to Cairo. This map was issued as plate no. XLIII in the 1844 edition of Black's General Atlas. Rumsey 2305.049 (1854 edition). Philips (atlases) 4334.